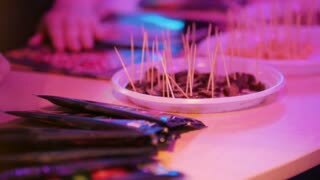 Small snacks on table at event party. Close up appetizing snacks on party table at holiday evening. Close-up view of wedding food bar. Summer wedding snack table. 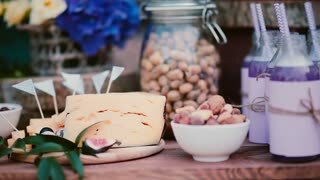 Flowers, cheese, nuts, figs and drinks. 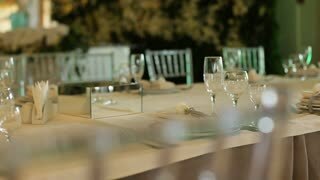 Close up shot of served white table with glasses, fork and knife for a wedding party. Close-up view of young couple sitting at the table, near the Christmas tree and open the holidays present, drinking tea. Close-up view of young couple sitting at the table and tie ribbon on present Christmas box in evening. Close-up view of young couple sitting at the table in evening and open the advent calendar together, drinking tea. 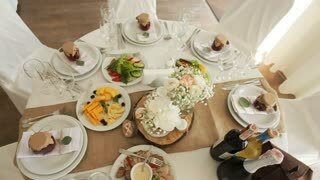 A close-up of table set for a meal indoors on a birthday party or celebration.